Illinois Permit Test - Get a free 2019 Driving Test Guide Today! This Illinois permit test, with multiple choice questions, is intended to help you prepare for the IL driving test that is required before you can get your driver’s license. If you have completed a defensive driving course, you may be able to save on your auto insurance premiums when buying new or used car either by financing, leasing or through bank car loan. To drive legally in Illinois, you must have a valid Illinois driver’s license, probationary license, instruction permit, Restricted Driving Permit or Monitoring Device Driving Permit. Vision and written tests are required for the issuance or renewal of all permits. Don’t worry, the Illinois permit test is a challenge that you can master; as long as you come prepared. Try our FREE practice test now! When you go to the DMV, you’ll need your legal guardian to go with you. You’ll need to pass the written IL driving test. The practice test comes in several variations ranging from easy to hard to very hard. Try our free test now. Are you ready to step into the world of Illinois driving? You’ve got an exciting practice permit test. It’s completely free, try it out! Visit us and take the practice Illinois driving test. Go back and study any information that you don’t know the answer immediately. Visit us and take a couple of the practice test. Go back and study any information that you don’t know the answer immediately. Taking a series of these practice permit tests helps you identify the areas where you need to spend that precious time studying. This license test contains 7 parts, 30 multiple choice questions. Test your knowledge of the meanings of traffic signs and road rules. Are you preparing for your IL Driving Test? You will want to read the information below. Illinois has a Graduated License Program (GDL) that is designed to help young drivers safely gain experience before being issued a full driver’s license. You may apply for an Illinois Instruction Permit (called a Learner’s Permit) when you are 15 years old. You must also be enrolled in a state-approved driver’s education course, or be 30 days away from beginning your course. To apply for a Learner’s Permit, visit your local Secretary of State facility with your parent/guardian. He or she must give written consent, if you are under 18 years old. What happens at the DMV Office? Pass the DMV written Illinois Driving Test. Click here for Rules of the Road. Once you have your Illinois Learner’s permit, you may begin the behind-the-wheel portion of your driver’s education course, and you may also begin logging the 50 required practice hours with your parent/guardian or licensed driver at least 21 years old. Ten hours are to be driven at night. You must hold your instruction permit for a minimum of 9 months before you are eligible to apply for an Illinois driver’s license. Your permit is valid for 2 years. Illinois also provides two helpful documents for parents and teens. They are not mandatory, but suggested to promote dialogue between parents and the new drivers. What happens when I have my Illinois Learner’s Permit? You are on your way to becoming a licensed driver! 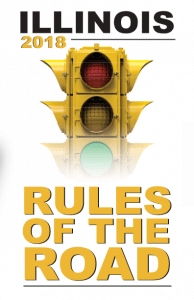 There are some rules and restrictions to obey after you are issued your Learner’s Permit. With a supervising driver at least 21 years old who has a valid driver’s license. With one passenger in your front seat, and only as many back-seat passengers as there are seat belts in your vehicle. All occupants must wear seat belts. With your instructional permit on your person at all times. Failure to carry it will cause you to lose your eligibility for a driver’s license until you are 18 years old. Sunday-Thursday: Between 10 p.m. and 6 a.m.
Friday and Saturday: Between 11 p.m. and 6 a.m. While using a cell phone at any time, unless you are in an emergency or need to report one. You may not text and drive in any situation. What happens when I am 16 years old? Parent/legal guardian must certify that a minimum of 50 hours of practice driving, including 10 hours at night, has been completed. Parent/legal guardian must accompany teen to provide written consent to obtain a driver’s license, OR complete and notarize an Affidavit/Consent for Minor to Drive form. Must maintain a conviction-free driving record for six months prior to turning 18 before moving to the Full Licensing Phase. A traffic conviction during the Initial Licensing Phase may extend restrictions beyond age 18. All occupants must wear safety belts. For the first 12 months of licensing, or until the driver turns 18, whichever occurs first, the number of passengers is limited to one person under age 20, unless the passenger(s) is a sibling, stepsibling, child or stepchild of the driver. After this period, the number of passengers is limited to one in the front seat and the number of safety belts in the back seat. Cell phone use while driving including a hands free device, is prohibited for drivers under age 19, except in the case of an emergency. Texting while driving is prohibited. All information regarding the Illinois Graduated License Program (GDL) is available here. * Your local curfews may differ from these state-imposed restrictions. Please follow your local curfews unless otherwise directed by law enforcement. When can I get an Illinois Full Driver’s License? Once you reach 18 years old without any traffic violations for the last 6 months, you’re eligible for full driving privileges. You may now drive without any curfew or passenger restrictions. You still MAY NOT use a cell phone while driving until you are 19 years old, and you may never text and drive. Your license will be valid until 3 months after you turn 21 years old. If you would like more information on the Illinois Permit Test, contact us today. The questions that appear on the seven interactive quizzes that are part of the practice tests are almost identical to the ones you will encounter on the real test. Once you are able to pass all of these quizzes then you are ready to take your real test. It might also be beneficial to complete a defensive driving course as this can reduce your auto insurance premiums. This applies to whether the car is new or used, and whether it is bought by financing, leasing or through a loan from the bank.